The ZyXEL VMG1312-B10D is the successor to the VMG1312-B10A. It is the default router supplied by AAISP from the summer of 2017. It is the younger sibling of the VMG3925, you can see more differences on the VMG1312 Vs VMG3925 page. 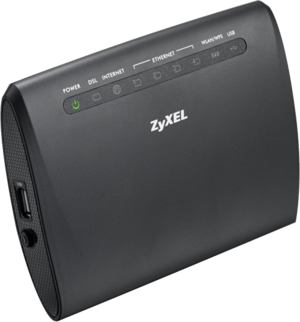 The ZyXEL VMG1312 (VMG1312-B10D) is an all-in-one ADSL/VDSL router with WiFi and 4 network ports. AAISP started supplying these in July 2017, these are now the default router. Modem supports VDSL (FTTC) and ADSL/ADSL2. FTTP using an ethernet WAN port doing PPPoE. Note: An AAISP configured router will have a different username and password. Pages in category "ZyXEL VMG1312 B10D"
Media in category "ZyXEL VMG1312 B10D"